Located in the cool heart of the Anderson Valley, our Split Rail Estate Vineyard is perfect for growing a refined expression of Chardonnay. In 2011, a rare combination of conditions also proved ideal for making a Late Harvest Chardonnay. 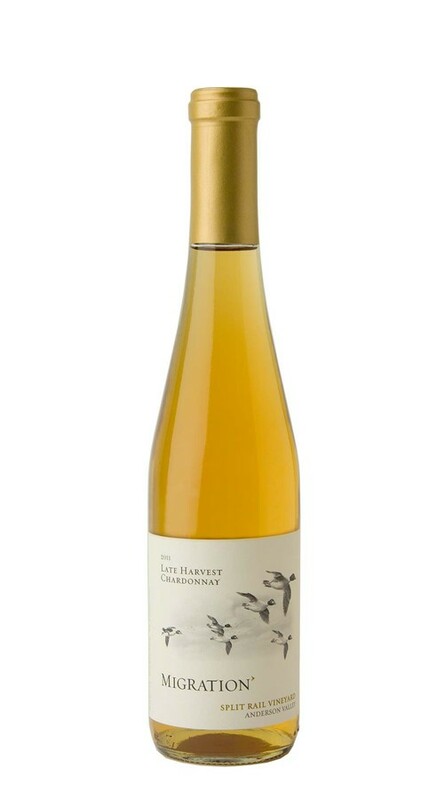 Though this wine offers a lush texture and concentrated layers of peach and apricot, it also possesses the acidity and signature orange blossom and mineral notes that make Split Rail Chardonnay so exceptional. A voluptuous texture and rich concentrated elements of candied apricot, honey, citrus blossom, toasted hazelnut, diesel and honeysuckle, this is a lush and layered expression of late harvest Chardonnay. At the same time, the cool vintage preserved ideal acidity in the wine, adding brightness and poise to Split Rail’s signature citrus and mineral flavors. The 2011 vintage was one of the coldest growing seasons in memory. In the vineyard, we benefited from our experience as cool-climate winegrowers, and the exacting control we are able to apply to our Estate vineyards. We adjusted practices to compensate for the weather, with extra leaf pulling and vineyard-floor cultivation. We also did extensive fruit drops in multiple passes to encourage complete ripening, with overall yields of approximately 2 tons per acre. The long, temperate season allowed for extended hang time, and the majority of our grapes were harvested before the rains. The resulting wines are bright and elegant with slightly lower alcohols, lovely aromatics, natural acidity and pure fruit flavors.